You might have read a few of my book reviews on here before, but this is one with a difference. It’s not a story about a guy travelling round South America chasing after the girl of his dreams or about a globetrotting Northern Ireland football fan. Let’s get serious for once. 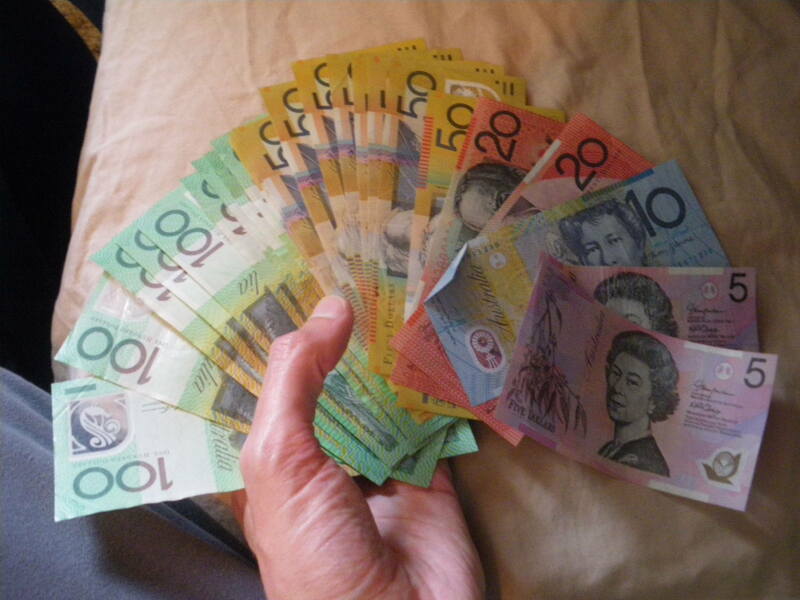 This is Nomadic Matt’s expert book on How to Make Money With Your Travel Blog. It’s an e-Book and it tells you how to make money with your travel blog! There are thousands of travel blogs out there. Thousands. I know because I’ve written a few of them and I’ve read hundreds of them! What? Free cash? 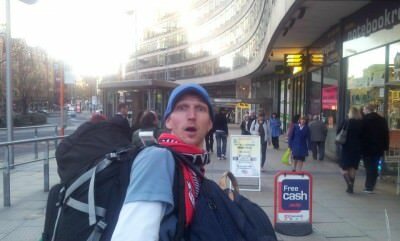 Backpacking round the world looking for that “golden ticket” or I could just buy a book on how to make money with my travel blog! Most of them don’t make any money, I also know this because that was once me – remember my old blog? Some bloggers live completely from earnings from their travel blog these days and you want some of that! The wait is over – you can now live the life you want by buying this book, monetising your blog and travelling the world. You’ll need to put the hard work in and actually have travelled of course, as I’ve no time for fakes but come on it’s worth a try isn’t it? You can start by buying Nomadic Matt’s book “How to Make Money With Your Travel Blog”! Book Review: How to Make Money With Your Travel Blog by Matt Kepnes. 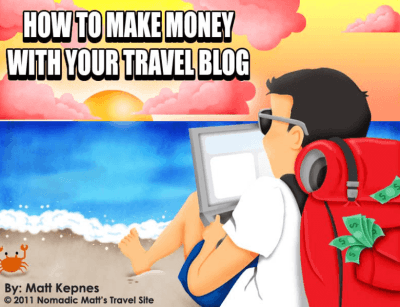 Why buy Nomadic Matt’s Book “How to Make Money With Your Travel Blog”?There are loads of reasons to buy “How to Make Money With Your Travel Blog”. A detailed explanation takes you through the procedures from setting up a travel blog, sorting out SEO, guest posts etc., marketing your travel blog to making money from your travel blog. It’s thorough and it’s detailed! It’s a long process but hang in there, pull through and you might just be in the money! Want to know how to make money with your travel blog? Buy Nomadic Matt’s book! Many successful professional travel bloggers have used this book to get the ins and outs of monetising a travel blog. Some of these bloggers have their comments and videos on Matt’s site. One of the main reasons you should buy this book is because Matt Kepnes has done things the hard way and learnt from his mistakes and he now knows how to do things properly, when it comes to travel blogging. 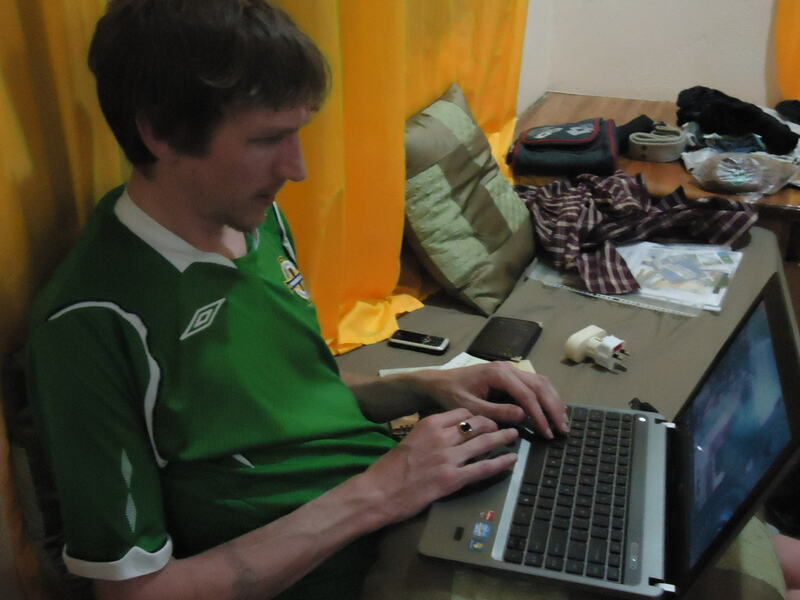 The mistakes that Matt made in his early days of blogging taught him what not to do when trying to monetise a travel blog. He shares that wisdom now in “How to Make Money With Your Travel Blog”. 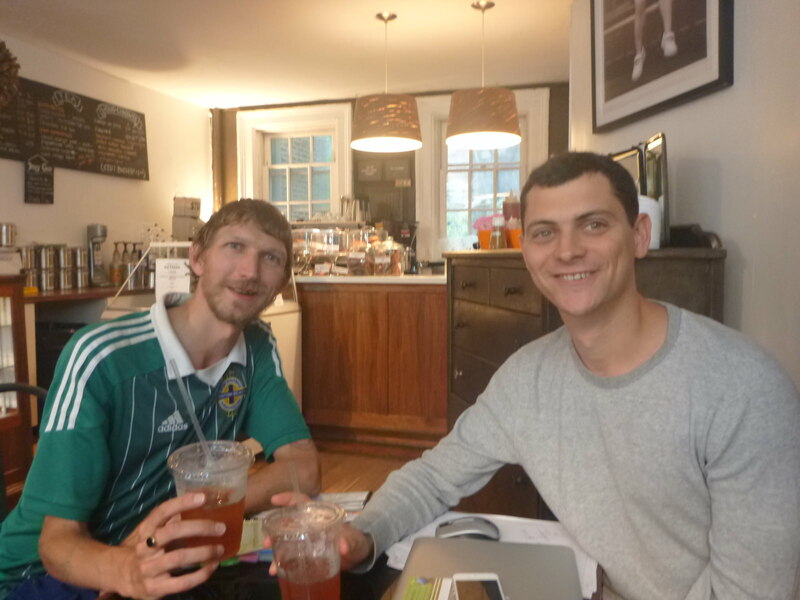 I met up with Matt in 2014 in New York City for a tea. Who is Nomadic Matt/Matt Kepnes? Matt Kepnes runs the fantastic website Nomadic Matt’s Travel Site and is not only a successful travel blogger but an extremely nice bloke! 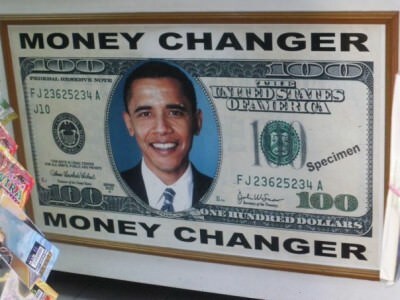 If you have you seen his monthly Q and A videos on You Tube you will know that. His website is the best travel blog on the internet, regularly he comes top of the rankings so he knows what he’s talking about. He regularly makes $8,000 US a month and offers readers LOTS of promotions. He has written a load of e-Books and even has a published book called How to Travel the World on $50 US A Day! How much does “How to make money with your travel blog” cost? This is the best bit. The book on it’s own costs just $27 US Dollars and comes with a 30 Day money back guarantee!! Matt offers to give you the money back after 30 days if you’re not satisfied with the book. So it’s a no risk purchase!! 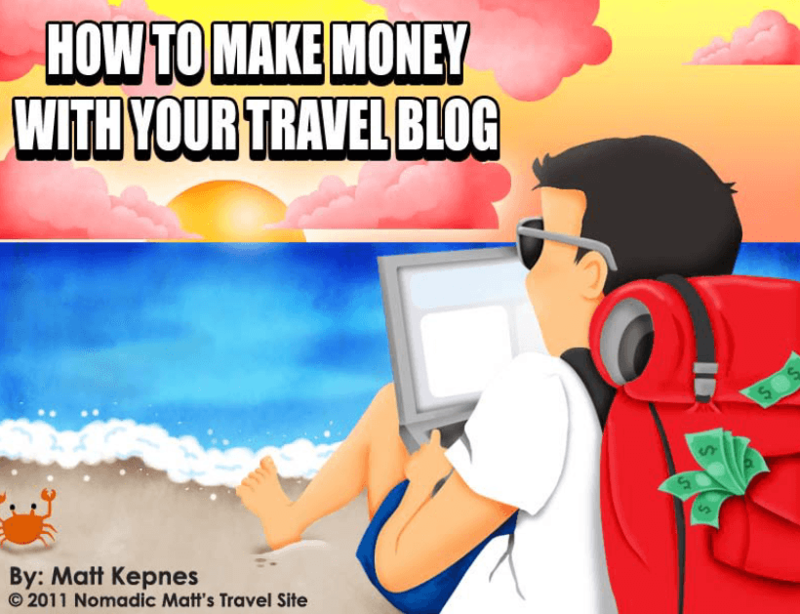 To buy Nomadic Matt’s (Matt Kepnes) book “How to Make Money With Your Travel Blog” just click on the link below and you can buy it immediately and get it sent in PDF form to your e-mail inbox. It’s that easy! And don’t forget to thank Don’t Stop Living for introducing you to it if you’re sitting on a beach in a year’s time having made money from your travel blog! Here are my own tips for making money from a travel blog. If you have a book you would like reviewed you can get in touch through my contacts or advertising pages. This entry was posted in Book Reviews, Books, Destinations, How to Make Money With Your Travel Blog, Lifestyle Design, Products, Travel Blogging. Bookmark the permalink. I was aware of his books but didn’t realise it was this cheap. I remember seeing his books listed on his website and the costs scared me off. I’ve virtually learnt all I know from online free resources and various kindle books. I wonder how Matt’s book differs? Clearly he has it down to a fine art since he is so successful. A good person to learn from I guess. Thanks for explaining. Sounds like a good reason to look into this.